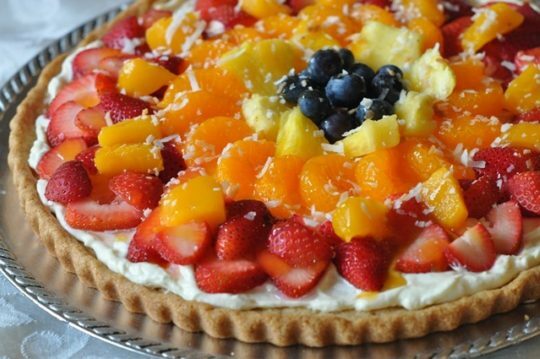 A big sugar cookie topped with luscious cream cheese filling and tropical fruit creates an easy and picture-perfect tropical decadence with seasonal fruit. Preheat oven 350F. Coat 12-14-inch pizza pan with nonstick cooking spray. Press cookie dough into prepared pan. Bake 12 minutes, cool. In mixing bowl, blend together sugar, cream cheese, and coconut extract until mixed. Stir in orange rind and whipped topping, mixing until smooth. Carefully spread cream cheese mixture on top of cooled crust. Arrange strawberry slices around edge of pizza. Next, arrange ring of mandarin orange segments around edge. Then, arrange pineapple chunks in another ring and then mango slices inside to fill center of pizza. In microwave-safe dish, microwave apricot preserves and orange liqueur just until blended, about 30 seconds. Spoon glaze over fruit. Sprinkle with toasted coconut, if desired. Refrigerate until serving. Terrific Tip: Go ahead and grate more orange rind than you’ll need for the recipe—you can grate a whole orange or lemon and freeze the rind until needed. Or, you can purchase dried orange rind in spice section of grocery. Substitute your favorite fruits. Recipe from Holly Clegg’s trimandTERRIFIC® Eating Well To Fight Arthritis. For more of Holly's easy healthy recipes and tips, visit her Blog andYouTube channel.